You won't find a better value for your vacation in the Winter Park area. 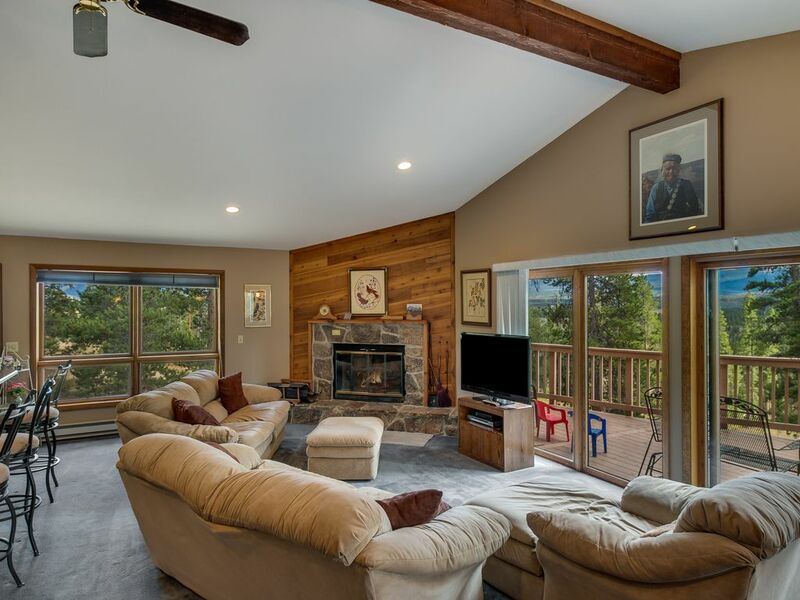 This home, located on a private one acre wooded lot lets you get away to quiet privacy, but is convenient to all the activities of the Grand County recreation area. Ten minutes to Winter Park. An hour and a half from Denver. Summer- biking, fishing, rafting, hiking, horseback riding, golf, alpine slide, Rocky Mtn National Park. Winter- downhill skiing and boarding, cross country skiing, snowmobiling, snow tubing, snowshoeing, all within minutes of the house. Devil's Thumb Ranch & Snow Mountain Ranch are also both dpopular with wedding parties and located nearby. Layout: Over 2,000 square feet in this home. There are three bedrooms and 2 baths on the first level. Bedroom 2 has a king size bed and reading chair. Bedroom 3 has two twin beds. These bedrooms share a bath. (Tub and toilet separated by a door from counter and sink) Bedroom 4 has 4 bunk beds and a bathroom. Upstairs is the great room, kitchen and master with king size bed. Master area has doors that can be closed off so toilet and sink can be accessed by others on main level without disturbing master, which has its own additional private counter and sink. Heat is individually controlled in each room, so everyone can have it set the way they prefer. Also works well for two families to share - parents have the king beds, up to 6 kids in bunk or twin beds. Updated kitchen has granite countertops and a generous supply of dishes, pans, utensils, crockpot, mixer, griddle- everything you need for cooking. Direct TV with DVD player. Garage with electric door lets you drive in without exposure to elements. This property has been in the family for years, but we took over in 2001. It is a favorite place to get away and enjoy the mountains, scenery and serenity and the kids have wonderful memories of the great times at the mountain house. It is available when we are not using it. We love Grand county because it has everything you could want, from skiing in the winter to all the summer activities. Easier to get to from Denver than Summit County - no congested tunnel to worry about. When you stay at the house, you are off in a quiet reserve - all the properties nearby are acre plus lots. When you step out on the balcony, you see mountains and trees, not someone else's house or driveway or balcony. But in a few minutes you can be at the ski hill, the grocery store, at the lake or golf course or doing any of the many activities in the area. Electric heat. Thermostat in each room. Towels, sheets provided, but not changed during stay. Typically flour, sugar, salt is on hand. Granite counters with counter seating for 4. Two downhill ski areas, 2 cross country ski areas within 10 miles. Loved our visit. Home is comfortable with great open living area and wonderful views. Probably best equipped rental home we have been in. Quiet area away from it all. Would love it if they did get WiFi. Hot spotting got expensive. I could see that a good snowstorm could make it difficult to get in and out particularly if no 4 wheel drive. We would definitely consider renting again if a 3 or 4 bedroom place needed. Great value. The house is well stocked and cared for because it is not purely a rental. It is used by our family members in Denver, so it is a second home for us. Brian was great to work with. Home location was perfect. Fast refund of security deposit. Don't hesitate to stay here. What an amazing experience. Plenty of space in this house. Very clean. Beautiful views. You really couldn't go wrong with this place. We had 2 families in this house with kids and we enjoyed every second of it. We can't wait to go back! Loved the place. The large and open living room/kitchen/dining area made the house feel huge for 9 adults. We had a fantastic family ski trip with four adults and five children! Great proximity to Winter Park, close to the town of Fraser complete with a super market and other needs. Brian was extremely responsive as a host and the house was exactly as advertised- Clean, comfortable, well stocked and easy to access. Will definitely be coming back!